Midorima Shintarou, who maintains this proverb as his personal creed so that he will be chosen by fate, lives a systematic daily life based on extraordinary effort and superstition. He thereby does everything in his power to succeed. He is especially conscientious where superstition is concerned. In the morning, he always begins by putting on his glasses using only his right hand. At night, after lying down once on his futon, he gets up again, stretches, dons his nightcap, and goes to sleep. Midorima forces himself to follow this extreme, peculiar lifestyle. And sometimes, in order to abide by these superstitions, he finds himself in situations like the present one. This happened on a certain morning. When Midorima awoke, he reached for his glasses with his right hand, just as he always did. “…hm?” Midorima questioned softly, still lying in his futon. His right hand brushed against the fabric of the futon instead of closing around his glasses. With his right hand, he searched the surrounding area for his glasses, but they were nowhere to be found. “What’s going on…?” Midorima muttered, irritated. He sat up and fixed his gaze on the place where his glasses should have been. On a normal day, his glasses would have been sitting by the side of his pillow, but now, they had disappeared without a trace. Midorima raised his eyebrows and cast a glance about the area around his futon. However, he saw nothing that resembled a pair of glasses. Now he was concerned with an entirely different problem. How had he been able to determine, with extreme ease, that his glasses were not anywhere in the vicinity? At the same time this question arose, Midorima touched his right cheek with his right hand. Something clinked beneath his fingertips. It was a familiar sensation. Midorima couldn’t help but sigh. Thinking back, he remembered that he had had trouble falling asleep the night before, so he had started counting the wood grains in the ceiling. Apparently, he had fallen asleep while counting, and as a result, he had worn his glasses all night long. Fortunately, since Midorima seldom moved in his sleep, he hadn’t dropped his glasses and crushed them with his body. Takao had teased Midorima about it when they shared a room during the summer training camp. However, this morning, thanks to Midorima’s sleeping posture, he had been able to protect his precious glasses. So the teasing was completely unwarranted, and perhaps being able to sleep without moving was a quality Midorima should be proud of. In any case, he had clearly made a mistake by falling asleep while wearing his glasses. How could I do such a thing…?, he wondered as he prodded his furrowed brow with a fingertip. He glanced at the clock and realized that it was past the time he had planned to wake up. The phrase “I’m late because I overslept” was not in Midorima’s dictionary. Just as if an electric current had coursed through him, his entire body stiffened, and he lost his balance. As his body pitched forward, he braced his right hand on the futon and was somehow able to catch himself before he fell. Midorima froze in that position as a feeling of despair washed over him. A bead of cold sweat rolled down his cheek. And then he realized the problem, which was something he should never have been able to overlook. As he stared into empty space, this single sentence fell from his lips. The grave tone of his voice signified that this was indeed a dire problem. One could argue that since he had first touched his glasses with his right hand, that could perhaps be interpreted as “using his right hand to put on his glasses”. This controversy gave rise to a great deal of debate (within the realm of Midorima’s thoughts). Moreover, it was morning. He would have to leave for school in a little while, so solving this problem was a race against the clock. Worrying about the situation would not grant him an extension. Mindful of the time, Midorima, who had reached this decision in less than a second, began to execute the best plan out of all the countermeasures he had devised. He laid his head back on his pillow. He had concluded that the only way to fulfill the first superstition of the morning was to get back in bed and repeat the process of getting up. He placed his glasses beside his pillow and closed his eyes. If he could repeat the process within a reasonable amount of time, it would be just as if he had awoken according to schedule. But Midorima promptly sat up again. He slipped out of his futon, performed his stretches, adjusted his nightcap, and crawled back into his futon a second time. Thus, having fulfilled the conditions of his pre-bedtime superstitions, Midorima rose once more and deliberately put on his glasses by using his right hand. At first glance, this string of preparations might appear to be meaningless. However, as far as Midorima was concerned, it was all part of doing everything in his power. In order to be chosen by fate, Midorima had accepted the fact that such efforts and hardships were necessary. But fate is always ready to impose unexpected trials upon us. It was a certain day in October. On this day, just like any other, Midorima put on his glasses with his right hand, finished getting ready in his room, and entered the living room. After greeting his mother, who was standing in the kitchen, he sat down at the table where breakfast was ready and waiting, then checked to see that the television was on. The show currently airing was, of course, “Oha Asa”. His timing was perfect. Right on schedule, the daily horoscope segment was just beginning. The announcer presented the horoscope and today’s lucky item for each astrological sign in sequential order. Midorima, who had been eating his breakfast while ignoring the other horoscopes, suddenly fixed his eyes on the screen. Midorima focused on the television so as not to miss a single word. “Red”? Midorima instantly called to mind all of the red-colored goods in his possession. He waited to hear the next words. At the sudden shock, Midorima spit out the rice he had been chewing and stared blankly at the television with his mouth hanging open. On the screen was not the “Oha Asa” horoscope segment he was accustomed to seeing. Instead, the screen displayed an image of an unfamiliar place. It was clearly a different channel. Midorima frantically searched for the remote control. Everyone in his family knew that he watched “Oha Asa” religiously. There was no way one of them would have changed the channel. As Midorima scanned the room, looking for the remote control, his eyes fell upon an unfamiliar object atop the low table in front of the television set. He froze in place. There, with one paw poised on the remote control that lay on the low table, staring up at Midorima with an adorable expression on its face, was a black cat. Midorima had not noticed before, but the window looking out onto the garden was open, the curtains fluttering in the breeze. It appeared that a stray cat had wandered in from outside. The cat meowed at him again, nimbly crossed the room, and hopped up on the table where the morning meal was laid out. Overcome by anger, Midorima reached out a hand to grab the cat. But the cat easily dodged his outstretched hand, snatched up the piece of salmon that had been part of Midorima’s breakfast, and leapt down from the table. But the cat could not understand human speech, of course, and it would not have stopped even if it had understood. The cat exited through the open window and vanished in an instant. “This is why I hate cats!” Midorima said in disgust before returning his attention to the television. Even if he were to change the channel back, the “Oha Asa” horoscope segment would have already ended. “How could this happen…,” Midorima groaned to himself. The fact that he had failed to hear the day’s lucky item was a serious affair. Internally, Midorima desperately sought a solution to this problem. Midorima bit his lip. He couldn’t think of a single good idea. Now that things had come to this, there was only possible choice he could make. Midorima balled his hands into fists, hurried through the rest of his breakfast, and returned to his room. “Whoa, Shin-chan, what happened to you? !” Takao Kazunari exclaimed in surprise upon seeing Midorima enter the classroom. Looking extremely sullen, Midorima removed his uniform jacket and sat down at his desk. Takao, whose desk was in front of Midorima’s, turned around in his chair so that he was facing backwards. With an amused expression, he watched Midorima mop the sweat from his brow. “We didn’t have practice this morning, so did you hop in the sauna or something? What’re you, some old guy? Midorima glared daggers at Takao, but Takao didn’t seem bothered in the slightest and instead smiled cheerfully back at him. Midorima thought for a moment and finally gave a long sigh. Rather than further complicate matters, he decided that it would be less of a hassle if he were to simply explain the situation. Takao’s almond-shaped eyes went wide. Takao looked at Midorima, who was sitting right before his eyes, and shook his head, apparently completely baffled. Midorima glared at Takao in annoyance. It was such an intense glare that if looks could kill, Takao would likely not have escaped unscathed. Takao relented and raised both of his hands in a gesture of surrender. Midorima heaved a long sigh for the second time and, with his elbows on the desk, cradled his head in his hands. Despite having experienced it first-hand, Midorima thought that there was no possible way he would be able to explain what had happened. That morning, Midorima left his house approximately on time and started to take his usual path to school. He was walking on a narrow residential street. It was a one-way street, one which cars seldom passed through. But that morning, strangely enough, there was a truck parked in the street. The truck was parked so that it took up the entire width of the street, such that the only way for him to continue on his way was to squeeze past the side of the vehicle. Since superstition dictated that he must take this path on his way to school, taking a detour was not an option. He could have waited for the truck’s driver to return, but he had no idea when that might be. Reluctantly, Midorima turned his body sideways and, walking just like a crab, started to squeeze his way past the truck. If he walked while pressing his back up against the wall, he would just be able to make it past the side of the vehicle. Midorima worked his way along as quickly and carefully as possible, but all of a sudden, he was jerked backwards. He turned his head in surprise, only to see that somehow the shoulder strap of his sports bag had gotten caught on one of the metal fittings on the bed of the truck. Repressing the urge to click his tongue in frustration, he reached out a hand to free the shoulder strap from the metal fitting. Telltale, oily fumes spewed out from the rear of the truck. It can’t possibly be… An unsettling suspicion struck Midorima. Takao, who had been listening to Midorima relate the story, wore an expression that was a mixture of shock and astonishment. “Why would I lie about something like this?” Midorima said indignantly. In the end, until the truck came to a temporary stop before merging onto a main road, Midorima had apparently chased after it as if his life depended on it. However, Midorima’s next words were a source of further astonishment. Takao didn’t miss the slight, strange pause that proceeded Midorima’s words. Midorima never finished his sentence. A female student shrieked behind him, and then a great deal of water cascaded over his head. With characteristic reflexes, Takao nimbly hopped backwards in order to avoid the spray. Flustered, the female student approached a water-logged Midorima. A flower vase was clutched in her hands. Takao could bear it no longer and burst out laughing. Midorima’s expression was murderous, but despite being dead in his sights, Takao could not stop laughing. Midorima glanced at her and merely said, “Don’t worry about it,” before he got up and walked out of the classroom. Takao turned to the female student and added, “It’ll be alright. Shin-chan’s got a change of clothes with him.” He then took off after Midorima. Midorima refused to answer and entered the boys’ locker room. Takao followed him as if it were the most natural thing in the world for him to do so. Midorima glared at Takao in annoyance. Takao gave him a wry smile. With nothing but a small sigh, Midorima turned away and started to undress. After he had changed into his spare uniform and started to return to the classroom, Midorima reluctantly told Takao his suspicions about what had happened. Takao’s eyes went wide. As he spoke, Midorima opened the fastener of his sports bag. Inside, there was a red ballpoint pen, a cup, a chili pepper, a plate, a one-eyed daruma, and a pair of high heels, among other items. His bag was overflowing with the color red. “Whoa…what a collection…,” Takao said. He picked up the pair of high heels. Takao’s amazed expression gradually shifted as he tried to suppress another bout of laughter. Takao was on the verge of bursting into laughter, but he somehow fought back the urge when he felt Midorima’s eyes on him. Takao raised both hands toward the ceiling as if to say all hope was lost. From there, he clasped his hands behind his head and looked directly at Midorima. Before he said anything further, Midorima cast a glance over his shoulder to make sure that no one was approaching him with a flower vase this time. Takao rifled through his school bag for a moment. When he found what he was looking for, he said, “Here ya go,” and held it out to Midorima. In response to Midorima, who was suspiciously eyeing the item being offered to him, Takao replied, “Can’t you tell? It’s a headband,” as if there were nothing unusual about it. Takao twirled the thin, red headband around with his left hand. Midorima immediately fell silent. Takao saw his chance and pressed his advantage. Midorima was absolutely silent. Takao quickly set the headband in place on Midorima’s head. Takao grinned…or rather, he smiled in satisfaction. That moment marked the first time since they had started attending Shuutoku High School that Takao had successfully managed to persuade Midorima. “…I figured that out a while ago,” Midorima replied while he massaged his temples. Even though it was still only mid-morning, he was already exhausted. First and second period were combined into a double period for art class. After they had relocated to the art room, they were tasked with making a sketch of a sculpture…or at least, that had been the plan. That plan never became reality—the reason being that Midorima had destroyed the sculptures. 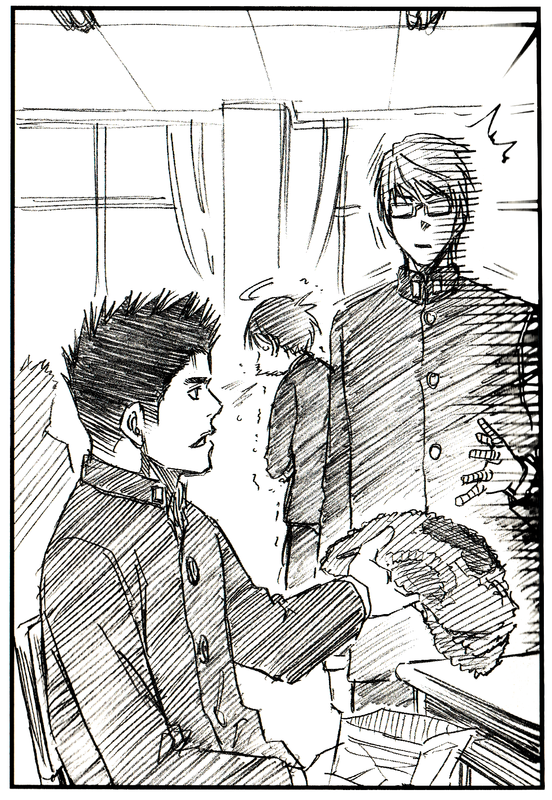 At the beginning of first period, the art teacher had directed Midorima and several other male students to place the sculptures around the classroom. The teacher planned to have the students divide into groups and make sketches of the sculptures. However, the sculptures turned out to be considerably heavy. Midorima stumbled while carrying one of them and fell down, and in the process, he managed to trip up another one of the students carrying a sculpture. Then, just like a line of dominoes, that student knocked over another student, who in turn knocked over another student… As a result of this chain reaction, all of the sculptures lay in pieces. As a matter of course, Midorima had to suffer a scolding from the art teacher. Back in the classroom, Takao returned the headband to his bag. He said, “Hey, cheer up, okay?” and patted Midorima on the shoulder. Takao flashed Midorima a thumbs up. Together, Midorima and Takao turned their attention to the doorway, where Ootsubo Taisuke, a third year, was standing. Ootsubo waved and said, “Yo,” while he waited for them to come closer. He offered the paper bag he was carrying to Midorima. Midorima accepted the paper bag and cast a sidelong glance at Takao. Takao nonchalantly averted his eyes. “…is it alright if I look at what’s inside?” Midorima inquired of Ootsubo, who answered, “Sure, go ahead,” with a kind smile. Upon seeing the item that had been withdrawn from the bag, Takao’s eyes narrowed. Standing beside a dumbstruck Takao, Midorima mutely withdrew a long scarf from the bag. Oostubo’s reaction elicited an immediate response from Takao. “Et tu, Captain?! But isn’t that what happened? !” Takao protested with a pout. Midorima and Takao looked back and forth between the scarf and Ootsubo, then stared at the scarf once more. It was quite well made. “It’s so long…,” Takao murmured. It was a thought that was better left unsaid, but the length of the scarf was such that it was practically begging to be verbalized. With a smile, Ootsubo pointed to the paper bag. His smile was overflowing with joy at having an opportunity to show off his handiwork. Midorima did as he was told and rummaged through the bag. One after another, he pulled out a red wool sweater, a handbag, a hat, a haramaki, a lap blanket, a coaster, a stuffed animal, mittens, and finally something that looked like a scrub brush. To top it off, all of them had been knitted with red wool. Takao was astounded. Beside him, Midorima was quiet, his expression drawn. He had been rendered speechless. Takao calmly crossed his arms and stared at Ootsubo’s hands. Takao hurriedly ducked his head and clamped both hands over his mouth, desperately trying to suppress the laughter welling up inside him. Ootsubo raised one eyebrow at Takao, whose shoulders were shaking slightly, but he didn’t press the issue. Then he left to return to his own classroom. 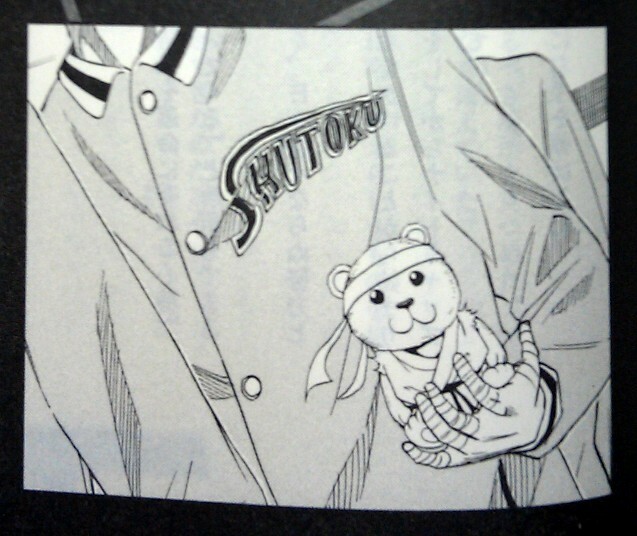 After seeing Ootsubo on his way, Midorima silently wrapped the scarf around his neck. Even at the beginning of autumn, the summer heat still lingered. The scarf was long enough to loop three times around Midorima’s neck with plenty to spare, by which point the insulating power of the scarf was absolutely stifling him. The sight was enough to make Takao laugh uncontrollably until he was on the verge of hyperventilating. At lunchtime, Miyaji Kiyoshi and Kimura Shinsuke dropped by Midorima and Takao’s classroom. “Hey, Midorima. We heard you almost died,” Miyaji said, sounding delighted. “It was a pretty close call, though,” Takao corrected with a smirk as he stood leaning against the doorframe. However, Takao wasn’t one to be intimidated by such things. When the shaven-headed Kimura asked, “So, what happened?”, Takao spilled all the details. In response to Miyaji’s wholly insincere sentiment, Midorima’s features twisted into a sour expression. Kimura presented the paper bag he held in his hand. Midorima scrutinized the paper bag with the look of a king examining tribute offered up to him by one of his retainers. “They’re goods from my family’s store! A red bell pepper, a red tomato, a red apple, and a red strawberry! They look delicious, am I right? !” Kimura answered proudly. Midorima silently accepted the paper bag before turning to Miyaji. Miyaji found that haughty attitude somewhat irksome, but he said, “I brought this,” and held out a red t-shirt. It was the one he often wore during practice. “You’d better appreciate this,” Miyaji said arrogantly, as if to emphasize that he was doing Midorima a favor. “No, you can keep it,” came Midorima’s immediate reply. Despite the racket Miyaji was making, there was no one around to back him up. Kimura said, “Just take it for now,” and forced Midorima to accept the t-shirt. By the time the two senpai had gone on their way, lunchtime was drawing to an end. After returning to his seat, Takao wiped away tears from the corners of his eyes. Midorima countered Takao’s sullen pout by saying, “I’m just being honest,” before withdrawing his bentou box from his school bag. Unless he ate quickly, afternoon classes would start before he could finish his meal. Asking a growing high school boy to miss lunch was the same as sending a traveler into the desert without any water. Takao, who had taken out his own bentou and picked up his chopsticks, looked at Midorima. Since Takao had eaten an early lunch mid-morning, only about half of his lunch remained. Even if he ate at a normal pace, he would easily be able to finish before the end of their break. On the other hand, since Midorima made a rule of never eating early, he would need to eat his lunch with considerable speed. Nevertheless, Midorima had only gotten as far as untying the handkerchief wrapped around his bentou box. “Aren’t you gonna eat?” Takao inquired curiously. Midorima was staring fixedly at his bentou. There was an uncharacteristic hesitancy to his manner of speaking that made Takao stop and look at Midorima’s bentou. It was Midorima’s usual rectangular bentou box, wrapped in the same handkerchief it was every day. Midorima still seemed unsatisfied with this explanation, but his appetite apparently won out, as he quickly untied the handkerchief. And at that moment, Midorima discovered the source of his uneasiness. Takao burst into laughter. Midorima fought back a headache. Midorima stared reproachfully at the item that was settled on the handkerchief. A Japanese dictionary, still in its case, was enshrined atop the handkerchief. No matter how many times he blinked, the dictionary wasn’t going to suddenly change into a bentou box. Apparently, amid the commotion caused by the thieving cat that morning, Midorima’s mother had packed the dictionary by mistake. As if to rouse Midorima from where he sat, hanging his head, the chime that signaled the end of the break echoed through the halls. After that, other members of the basketball club dropped by one after another to deliver red items to Midorima. Originally, Takao had only sent a text to Ootsubo, Miyaji, and Kimura, but it seemed that the three of them had then taken the initiative and forwarded that text to the rest of the club members. The items they brought were incredibly varied. In addition to stationery such as a compass, a ruler, and an eraser, they also received items that made them wonder why someone would bring those items to school, including a water gun, a red rose, a tengu mask, and a string of prayer beads. Among the people who delivered items, there was even someone who had misunderstood the situation and brought baby diapers with him. (4) Midorima’s bad mood worsened by leaps and bounds, while Takao laughed so hard that he got a stomachache. However, no matter what items people brought, Midorima’s unluckiness did not abate. Naturally, he had already received a scolding from the teacher. Rather, by that point, the teacher was essentially scolding the heap of red items overflowing from Midorima’s school bag and surrounding him while he sat through the lecture. After school, Takao patted Midorima on the shoulder as the latter sat slumped over his desk, exhausted. “Hmph…” Midorima grunted and stood up. Midorima stopped packing up and stared at Takao. While he spoke, Takao started packing up his things, as well, but he stopped when he realized that Midorima had frozen in place, silent. Midorima’s expression was both angry and sulky. Takao looked at him in astonishment. Midorima fell silent once more, and he fiddled with his glasses as if he were trying to hide something. Upon seeing this, a light bulb went off in Takao’s head as he was struck by a sudden realization. With that, Midorima finally resumed packing up to go home. Good grief, Takao thought to himself. What, your brain short circuits when you get embarrassed? When are you gonna learn to be honest with yourself? It seemed that being worried about by his teammates made Midorima feel a bit uncomfortable. After collecting red items from his teammates throughout the day, he had finally realized that they had gone to such lengths because they were “worried about him”—but now he was perplexed and unsure how to respond. Geez, our ace is such a handful. A smile quirked at the corners of Takao’s mouth, but he was careful to keep this expression hidden from Midorima while he sent a text to Ootsubo to let him know they would be absent from club activities. Even after they left school, bad luck continued to target Midorima. He fell down in the street five times. He collided with another person four times (one of those times, he bumped into someone making deliveries for a soba shop, and—sure enough—he ended up wearing a bowl of soba on his head). He was barked at by a dog four times. He was almost run over by a car twice. He was splashed by someone watering a garden. He brushed his hand against a freshly painted wall. At a vending machine, he pressed the button for “Oshiruko”, but the machine dispensed a can of hot tomato juice instead. “It’s actually kind of clever the way the bad luck’s finding ways to keep coming, don’t ya think?” Takao said thoughtfully as he walked beside Midorima down the sidewalk in the shopping district. Midorima’s expression was gloomy as he shifted his grip on the shoulder strap of his sports bag. There were no longer any red items inside the bag. For the time being, they had left all of the items at school, since it was clear that today’s lucky item was not among the various items they had gathered throughout the day. “We managed to collect quite a few red items, didn’t we? I wonder how many there were,” Takao muttered. At that moment, he heard a faint shriek from somewhere nearby. It was the voice of a young girl—one who sounded incredibly distraught. Takao spun around, searching the vicinity for the source of the voice. “What’s wrong?” Midorima inquired warily. Midorima pointed to the neighboring construction site. It appeared that a new building was being constructed. The site was surrounded by a guard wall and sheeting, and the sounds of rebar being welded and material being hammered continued without interruption. Takao turned around and saw what he had been looking for. Next to one of the trees planted along the sidewalk stood a young girl who looked to be about five years old. She seemed upset. She had tears in her eyes, and she was staring motionlessly toward the top of the tree. When Takao lifted his gaze, he saw that a pair of balloons was caught in the tree. Perhaps because the strings tied to the balloons had become entangled, the balloons were next to each other, bumping against the tree branches. Midorima tilted his head to one side in confusion at Takao’s muttered statement. He followed Takao’s gaze and finally understood the situation. “Children lose things all the time,” Midorima said brusquely. He started walking, but Takao laid a hand on his shoulder and forced him to stop. In response to Takao’s question, Midorima huffed and answered with silence. Then Takao dealt the finishing blow. When Midorima looked up once more, he saw that both of the balloons caught in the tree were indeed red. “If you’re gonna look for every red item under the sun, then why not a balloon?” Takao said with a grin. Midorima glared at Takao in annoyance, but he yanked his sports bag off his shoulder and shoved it at him. Takao gleefully accepted the bag and rushed over to the girl. He crouched down to her eye level and started talking to her about something. As she listened to Takao speak, little by little, the girl’s expression became colored with surprise. When Takao pointed to Midorima, the little girl looked at him with eyes brimming with astonishment and hope. Midorima turned away, feeling uncomfortable, and readjusted his glasses. Not a single thing has gone right today, Midorima thought with a scowl. Takao stood up and moved off to one side with the girl, so as not to obstruct Midorima’s jump. With that, all the preparations were in order. There was no reason to wait any longer. Midorima exhaled softly and flexed his ankles. He was wearing the everyday shoes he wore to commute to and from school, but he thought he would be able to jump high enough to retrieve the balloons. The bigger problem was finding the will to do it. “Nothing has gone right today…,” Midorima muttered, his voice tinged with resignation. He started running. A deafening crash resounded behind him. A scream immediately followed. After landing back on the ground, Midorima frantically spun around—and could not believe his eyes. The strip of sidewalk from which Midorima had jumped had now vanished. Well, that wasn’t entirely accurate. Some of the materials from the construction site had collided with the guard wall and caused it to collapse. The sidewalk was completely hidden from view. Midorima felt his throat go dry. Just a few seconds ago, he had been standing in that exact spot. If he had not started running when he did, he would have been crushed beneath the wall as it fell. Midorima stared unblinkingly at that spot. Takao was also staring at the site of the accident, his eyes wide as saucers. Something warm touched Midorima’s hand. As a result, he snapped out of his reverie. The little girl’s hand was on his. Against the warmth of her hand, Midorima’s hand felt chilled to the bone. She was staring eagerly at the balloons. It seemed that she considered them to be a more pressing issue than the accident. Her face lit up with a smile, and she accepted the balloons. Midorima did a double take. With those words, Takao saw all the pieces fall into place. Takao crouched down to the girl’s eye level. “Hey, listen… By ‘lucky item’, do you mean the one from the ‘Oha Asa’ horoscopes?” he asked tentatively. The girl offered one of her two balloons to Midorima, who accepted it without complaint. The girl smiled sweetly in satisfaction and hurried on her way. As she ran, the red balloon bobbed along behind her. Together, Midorima and Takao turned to face the site of the accident. Fortunately, it seemed no one had been injured, but the area was still in a state of chaos. They could hear patrol car sirens in the distance. With an unsettled, weary expression, Takao rose to his feet and stood beside Midorima. (1) As a side note: Ironically, cosmos flowers represent peace, order, tranquility, and harmony. (3) That’s 6’3” (195 cm) of scarf. I have newfound respect for Ootsubo. (4) The Japanese word for “red” is “aka” (「赤」), while the word for “baby” or “infant” is “akachan” (「赤ちゃん」), which uses the same kanji and reading as the former. Someone apparently misunderstood the text message, although why a high school boy would bring diapers to school is beyond me. So, canon: Takao has a little sister. Being an older sibling myself, I somehow expected that. XD No wonder he’s so good at dealing with children and Midorima. Ю　O三　＼(￣^￣＼） Three points! hmmm..haven’t heard of this one..is this a novel of kuroko no basket?? Thank you so so so much for filling this!! You are so precious!! thanks very much for this! this was such a delight to read; I am filled with Shuutoku feelings right now. OMG!!! Thank you very much for your hardwork! I’m totally enjoying this as a huge fans of Tsunderima! I updated the page with a download link for a PDF file of the translation. Thanks for your comment! Thanks so much for your translation and your kindness!!! You are sweet! I’m so glad to hear that you enjoyed the translation. Yeah, I love reading about Midorima and Takao’s antics. 😀 Thanks for your comment! hello hello, i would like to ask your permission and see if its okay to post your translation/link into my tumblr account as i accumulate all the replace novel link and translation for fans to find them easily, i will source it back to you. its okay if you hate the idea though 😉 thanks for the translation!! Thanks for your comment! 😀 Glad to be of service. im so glad i have read this!! it feel so good reading MidoTaka canon moments. As usual Midorima is such a tsundere but of course Takao can always handle him. I just had a feeling that its not consistent with the other duet series of Midorima and Takao. From the audio drama Takao picked up Midorima from there house, so the truck incident wouldn’t have happened and I thougt Takao only listened to Oha Asa horoscopes for Cancers. So he must have known Midorima’s lucky item then… but i shouldn’t really care about those details now, should i? Again, thank you for this! It might seem inconsistent, but Takao usually picks Midorima up at his house when they’re going somewhere basketball related (i.e., the Seirin vs. Kaijou practice game, the first Seirin vs. Shuutoku game, Shuutoku’s practice game in the audio drama, and practice at Shuutoku in the mini drama from the duet CD). Maybe Takao only picks Midorima up on certain mornings? Thanks so much for doing these translations!!! I love these two! thanks so so much for your translation, you are so adorable ! Sure, go ahead! All I ask is that you provide a link back to this page when you post your translation.